Another caption slip reads: "Photographer: Snow. Date: 1958-12-03. Reporter: Thackery. Assignment: Malibu fire. 3-25-26: Fire burning behind Our Lady of Malibu School. 23-24: Father Joseph Burbage in front Malibu Church. Fire in background. 27-28: Lawrence Pitman?, 13 (left) & his brother, Greg, 9, & their horses, Boots (left) & Spike (right) -- refugees from the fire, they tie horses in Supermarket parking lot. 39: Burned home of C.C.McPeek at 26179 Fairside Dr. 109: Fire behind 23919 Malibu Road. 87: Fire at Highway 101 & Malibu Canyon Rd. 96: Fire in Malibu Can. Rd. 40: Burned house on Fairside Dr., no address. 110: House threatened across from 24132 Malibu Rd. 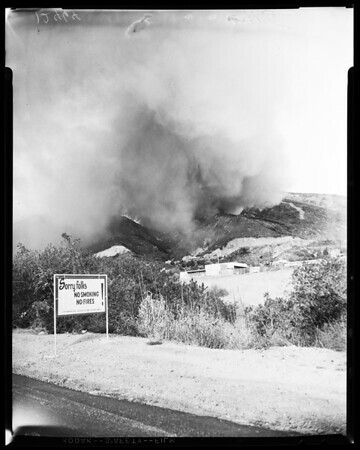 97-98: Burned home of actor Lew Ayres. 60-88: 2 burned fire trucks. 59: 1 nurned fire truck - same as above".